I was willing to understand a little bit better the physics behind iceskating. 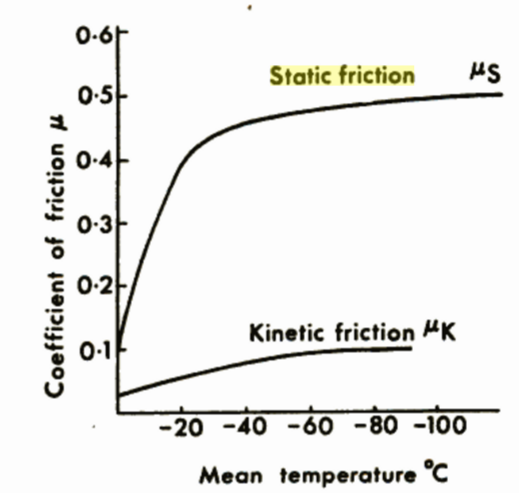 From New Scientist (1964) (probably not the most up-to-date reference $\ddot \smile$), I found a diagram showing the relationship between both the static and kinetic coefficients of friction and the temperature (x-axis is reversed) for ice. When we ice skate, we put a big pressure on the ice. As the ice is less dense than liquid water, this pressure may eventually be high enough to turn ice into liquid water. Intuitively I would think that high pressure would yield to high temperature but I suppose that this would hold true exclusively for gazes ($PV=nRT$). In any case, I don't quite have a good intuition for why warmer (or more pressurized eventually) ice would decrease the coefficient of friction of ice. What is the intuition behind the fact the coefficient of friction of ice decreases as temperature increases? Does the coefficient of friction of ice decreases with higher pressure too? For the same reason as above? As a correlated-side effect of increasing temperature? Why do ice skates slide so well? Because it puts a high pressure on the contact surface or because it puts a high pressure on the contact surface which in turn increases the temperature? My understanding of ice skating is that it has to do with the pressure of the skate, melting the ice and you skate on the melted water. 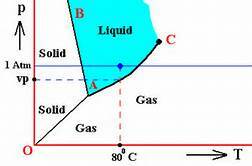 Look at the phase diagram of the water. At 1 atm, the water is solid, but at higher pressures (keeping the temp. the same) the water changes to a liquid. Not the answer you're looking for? Browse other questions tagged physical-chemistry kinetics phase temperature pressure or ask your own question. How does the process of protein denaturatation work? How does the London force work at absolute zero? At what point does decreasing solvent temperature cause a decrease in gas solubility? How does an oscillating reaction work?